Save $300 per person with reservation and deposit submitted Jan. 31st, 2019! The highlight of the Treasures of China tour allows you to experience the unique cultures and the breathtaking natural beauty in Tibet by taking classic train with soft sleeping compartment. In addition you will also have the opportunity to visit the giant panda breeding base in Chengdu where you will have close interactions with the giant pandas at different ages. If you have been to China before and wish to visit the off-the-beaten track destinations with a unique experience in China, this tour is your choice. Enjoy most of the day for leisure or taking one of the optional tours in Beijing, before taking a transfer to the train staiton. Start your journey to Lhasa, Tibet by taking Train Z21 with closed aerobic system departing from Beijing west Railway Station at 20:10 pm as scheduled today. 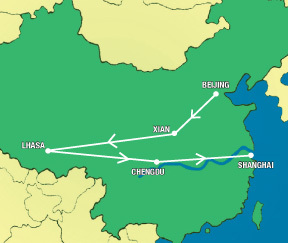 The total train ride takes 40 hours and 58 minutes in time and 3757 KM in distance with stops at Beijing West, Shijiazhuang North, Taiyuan-Zhongwei, Lanzhou, Xining, Delingha, Golmud, Nagchu and Lhasa as the final destination. While on the train, enjoy the scenery of Northwest China on the way and gradually adapt yourself to the high elevation and plateau climate. While on the train, enjoy the scenery of Qinghai-Tibet Plateau. You will pass by such well known natural attractions as Golmud, Kunlun Mountain Pass, Tuotuo River, Tanggula Mountains, Nagchu and Damxung with arrival in Lhasa at 13:08 pm as scheduled. Lhasa, the capital of Tibet, is often referred to as the "City of Sunshine" with more than 3000 hours sunshine annually. Upon arrival in Lhasa, you will be met by the tour guide holding the name sign at the roadside of the railway station square, and transferred to your hotel for hotel check-in (Transfer to your hotel in downtown Lhasa takes about 30 minutes.). Enjoy the rest of the day adapting yourself to the high elevation. After breakfast, you will drive eastward to Mila Mountain Pass along G318 National Highway and Lhasa River. En route, you will pass by Dagze County and Maizhokunggar County. Mila Nountain Pass, situated 5013 meters (about 15,000 feet) above the sea level, is the boundary between Lhasa and Nyingchi. You will make a ten minutes stop there due to the high elevation, before drving downward to Basongtso for one hour stay. Baosongtso, referred to as " Paradise on Earth", is well known for the glaciers, lakes, forests, waterfalls, pastures. relics, temples and rare plants. Afterwards, you will arrive at Bayi Town, the seat of Nyingchi for overnight stay. Today's total ride with motor vehicle is about 500 KM. Therefore, a few stops will be made during the ride. After breakfast, you will set out to Nyang Pavilion for a tour, where you will also visit the Southeast Tibetan Cultural Heritage Museum and Nyingchi Niangru Wetland Viewing Platform. Afterwards, you will drive back to Lhasa along National Highway G318. Quite a few photo stops will be made during you ride back to Lhasa. The tour today you will cover the landmark buildinbg of Tibet-the Potala Palace, listed as a UNESCO World Cultural Heritage Site. Potala Palace was built in 7th century and has served as the residence of Dalai Lama and the Winter Palace to handle the civila and religious affairs since the 17th century. After lunch, you will visit the Johkang Lamasery, which was built in the 7th century and enshrines the 12 year old life-size Buddha Shakyamuni statue. Later in the day, you will stroll along the bustling Barkhor Street filled with prigrims and various local handicafts. After breakfast, you will drive westward to Yarlung Tsangpo River along National Highway G318, and continue the drive along the mountain highway to the top of Mt. Kampala (4990 meters, about 15,000 feet above sea level). Here, you will enjoy the breathtaking view of Yamdrok Lake (4441 meter, or about 13,325 feet above the sea level), one of the three holy lakes in Tibet. Today you will drive to Lake Namtso for a visit with a total driving distance od 500 KM. During the ride, you will pass by the Northern Tibet Prairie and Qinghai-Tibet Highway. You will also cross the Lakenla Pass before reaching Namtso Lake, one of the three holy lakes filled with islets of different shapes. On some of the islets, you will find unique rocks and grottoes. The lake gives impressive view by reflecting the backdrop of glaciers, mountains, prairies all in one pircure. Drive back to Lhasa in the afternoon. After breakfast, you will take a departure transfer to the airport for your flight to Chengdu. Upon arrival in Chengdu, you will visit the Temple of Marquis Wu in memory of Zhu Ge Liang, the famous strategist during the Three Kingdoms period. Enjoy the authentic Sichuan cuisine dinner, followed by Sichuan Opera Show tonight. The excursion today takes you to the the Panda Breeding Base, located 40 minutes drive away from the city of Chengdu. The 25-acre center houses 20 or so on-site giant pandas playing, sleeping and eating bamboo.You will enjoy watching the giant pandas at different ages and may wish to hug one of the pandas for photo taking (advance reservation and extra fee needed). Return to the city in the afternoon to stroll around the Narrow & Wide Lanes lined with pubs, local restaurants and boutique stores. Enjoy the rest of the day for leisure. 10 nights hotel accommodations at five-star deluxe hotels. 24 meals: 10 breakfasts, 7 lunches, 7 dinners including Sichuan cuisine dinner in Chengdu. Cultural entertainments: Sichuan Opera Show in Chengdu. The above land only prices are inclusive of the train fare (Beijing to Lhasa) based on soft sleeping compartment (4 passeners in one compartment), all domestic air fares in China along with Chinese taxes and air fuel surcharges. The departure dates are negotiable for a party of at least 4 passengers travelling together.